Chandigarh June 11, 2016. Sh. Satya Pal Jain, Additional Solicitor General of India and Ex-MP from Chandigarh has been appointed as a Part-time Member of the Law Commission of India. This appointment is in addition to his appointment as an Additional Solicitor General of India. The President of India had constituted the 21st Law Commission of India on14th September, 2015. Dr. Justice B.S. Chauhan, a retired Judge of the Supreme Court, is the Chairman of this Commission and other nominated members of this Commission are Mr. Justice Ravi R. Tripathi, retired judge of the Gujarat High Court; Sh. Bimal N. Patel Director, GNLU and Sh. 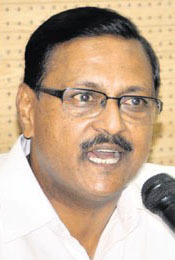 Satya Pal Jain. The Secretary Department of Legal Affairs & Secretary, Legislature Department of Ministry of Law & Justice of the Government of India are ex-officio members of the Commission. Sh. Satya Pal Jain joined as Member of the Commission yesterday at Delhi. He later met Dr. Justice B.S. Chauhan, the Chairman of the Commission and had discussion with him regarding the issues pending before Law Commission of India, lasting for about one hour. The Law Commission has been constituted by the Central Government led by Prime Minister Sh. Narendra Modi to study judicial reforms in the country, various legal issues as well as the laws which have become redundent and to make its comprehensive recommendations to the Government of India. Sh. Jain is a noted constitution lawyer and senior BJP leader. He has been a lawyer in various important civil and criminal cases, Liberhan Commission of Enquiry, Presidential Election disputes, various Election Petitions and other important civil and criminal cases. He has been the Dean of the Law Faculty of Panjab University and is a Member of the Panjab University Senate since the last 40 years. He has been closely associated with the ABVP, RSS and BJP.